MrBeast has pulled off another pro-PewDiePie stunt — this time during one of the year’s most-watched events. 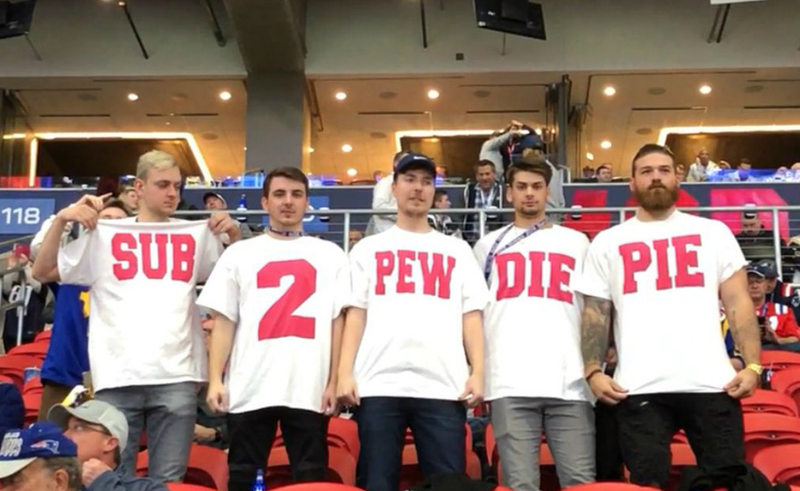 The YouTuber (and four friends) managed to make a “subscribe to PewDiePie” message very visible during yesterday’s Super Bowl. They each wore a shirt making up part of the phrase, and sat directly behind the field goal on the Los Angeles Rams’ side of the stadium. The battle for the No. 1 spot has inspired multiple stunts from fellow YouTubers and fans — including, of course, Donaldson (whose own subscriber count has risen to 14.5 million in the process). His previous pro-PewDiePie feats include buying every billboard in his hometown to plaster them with “subscribe to PewDiePie” ads, and saying “PewDiePie” 100,000 times during a 12-hour marathon livestream. This time around, Donaldson was originally hoping to sell “subscribe to PewDiePie” T-shirts so fans could help him raise money to purchase a 10-second spot during the game. A 30-second Super Bowl commercial cost $5.25 million this year, so for a 10-second spot, we’re talking $1.75 million. Instead, he went to plan B: buying five tickets and becoming a living PewDiePie advertisement throughout the whole game. For the curious, tickets this year averaged $4,380 each, so Donaldson, who’s famously generous with his cash, likely spent around $20,000 for them all to attend. And for Donaldson, it seems to have all paid off.